Right from the beginning in 1961 Fröling have specialised in the efficient use of wood as an energy source. Today the name stands for modern biomass heating technologies. The firewood, wood chip and pellet boilers ranging from small domestic to industrial scale are successfully used across many European countries and further afield. State of the art production facilities guarantee quality in to the smallest detail. As the main agents of Froling we have installed over 800 boilers in Ireland ranging from small domestic to large commercial and agricultural installations and with a combined capacity in excess of 90 Megawatts. Fröling was the first to successfully install hi tec wood biomass boilers in Ireland with a Lambdamat 320 Industrial installed at Camphill Community Clanabogan County Tyrone in 1998-99. Due to its highest quality standards, top efficiency, ease of operation and attractive design features a Fröling boiler is a sound investment for people who care for the environment and appreciate high tec top of the range quality. 1988 The FHG Turbo Firewood Boiler marks a new era in the economical and efficient use of wood for heating. 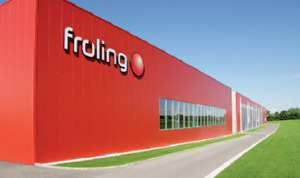 Today Fröling employs around 500 people and enjoys success throughout Europe, exporting its firewood, wood chip and pellet fired boilers at a rate of over 70 % of production.